As you may know, Christchurch, New Zealand was hit by a 6.3 magnitude earthquake on 22nd Feb, causing substantial damage and some loss of life. I live 2 hours drive away, but for 8 years Christchurch was home. My wife is from Christchurch, all her family live there and we have alot of friends who also live there. Christchurch is where I started my interest in wargaming, and is very close to my heart. When an earthquake hit in September last year, I organised a series of charity Wargaming events, (a gaming tournament, a raffle and some online auctions) we managed to raise $555 for the Red Cross Earthquake Relief Fund. This time other people are organising Wargaming events in my area, so I have been trying to think of another way we can raise money for charity. So I was lying in bed the other night, when a bolt of inspiration hit me (and it wasnt my wife digging me in the ribs because I was snoring either!). So I approached Chessex dice about getting some dice made. 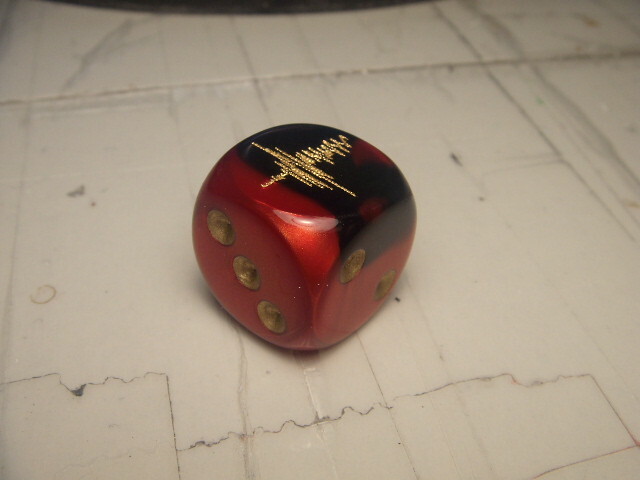 The dice are a nice mix of Red and Black colours, their Gemini design with gold pips. Then on the 6 pip side, we have a seismograph. The quake was a magnitude 6, after all. Red and Black are the traditional colours for Christchurch based sports teams, and is reckonised thoughtout New Zealand as being the colours of Christchurch. 100% of profits will be donated. 50% will go to the Red Cross Earthquake Appeal, with the other 50% going to the 2 wargaming clubs in Christchurch (the Christchurch Cavaliers and the Christchurch Wargaming Club). The gaming clubs are still closed, and they have not been able to get in to see what the state of their terrain, table etc are in, but I have a feeling there will be alot of repair work needed. I think its kind of nice for gamers to be helping gamers. 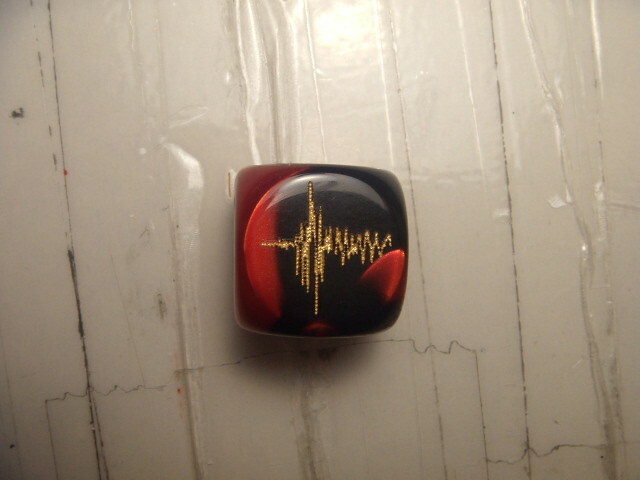 These dice will be sold in sets of 6 for NZ$12 plus postage. So send an email to quakedice@gmail.com to place your order. 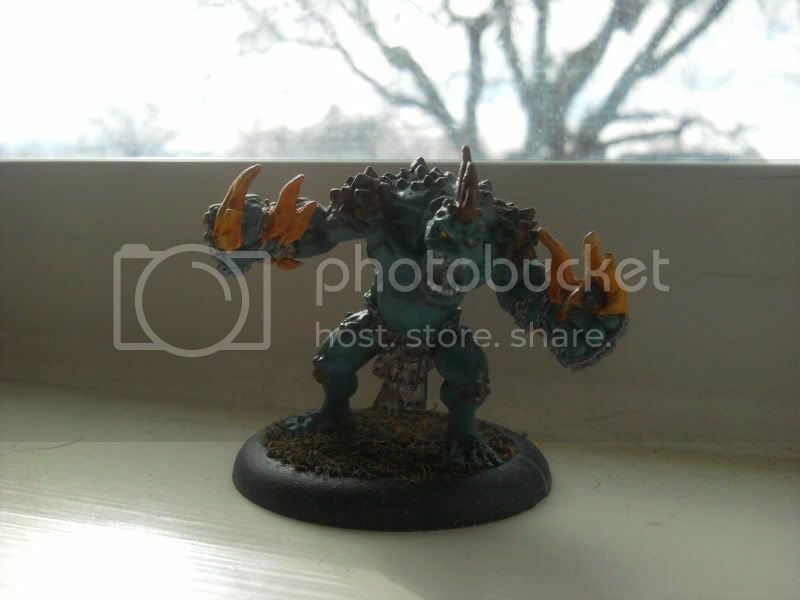 So, my first offering to the painting section on the Scrum finds me at sort of an impasse. I am not a terrible painter, but I am a new painter. So take what I write here with a grain of salt and learn from it (if you can) all of my quick and dirty techniques to completing a model quickly and for a nice table top quality finish. In started initially painting Calandra for this Blog, but seeing as it’s my first you lucky Trolls get a double feature. As I also painted a wonderful Janissa! So, below I will detail my process. 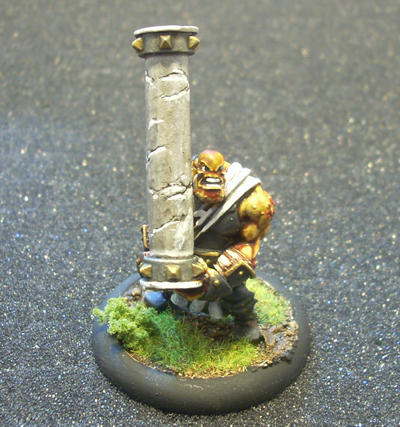 She has got quite a bit more fine detail then the Caber I painted for the Show Me Your Caber Contest, which presented me with a few new challenges. Also, she’s the first female model I have painted so painting highlights and such on her was particularly difficult. So the latest in the installment of 13 Pyre Trolls is one that has been eagerly awaiting his final touches... every time I get ready to finish him something else takes his place. So here he is, the ever incomplete Pyre Troll I have name Finishe. Yeah I know its a lame name but whatcha going to do. He is sitting on the window by my desk wanting to play outside with the other Pyre Trolls. 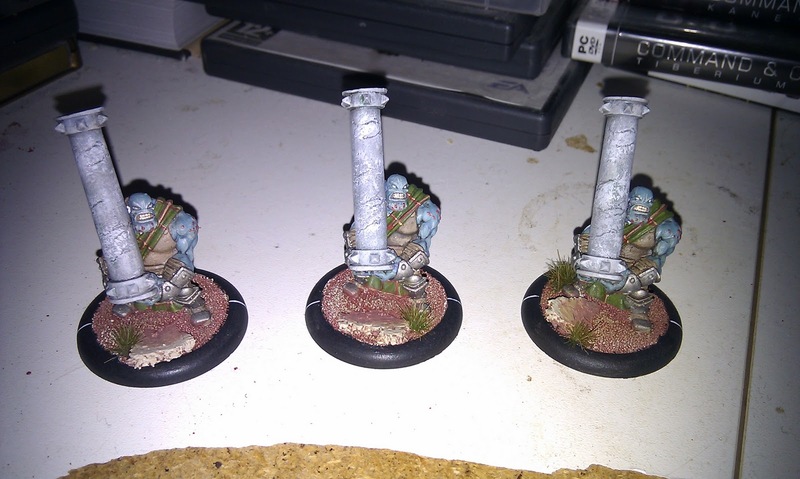 For the record 11 of the 13 Pyre Trolls are now painted to completion and one of them has hit the table. Six of them were done as a painting competition at our LGS so they will all be shown at the same time, hopefully next week. Also, last week six of us decided to spend the night painting instead of playing. In homage of my pDoomshaper that we have been passing around painting a little on here and there for the last month or so we decided to each pick a model. The rules were simple, paint on it for 20 to 30 minutes like it was your own (it was the first round) and pass it on. By the time the night was over most of our models looked pretty fantastic and all of them were about 90% complete. 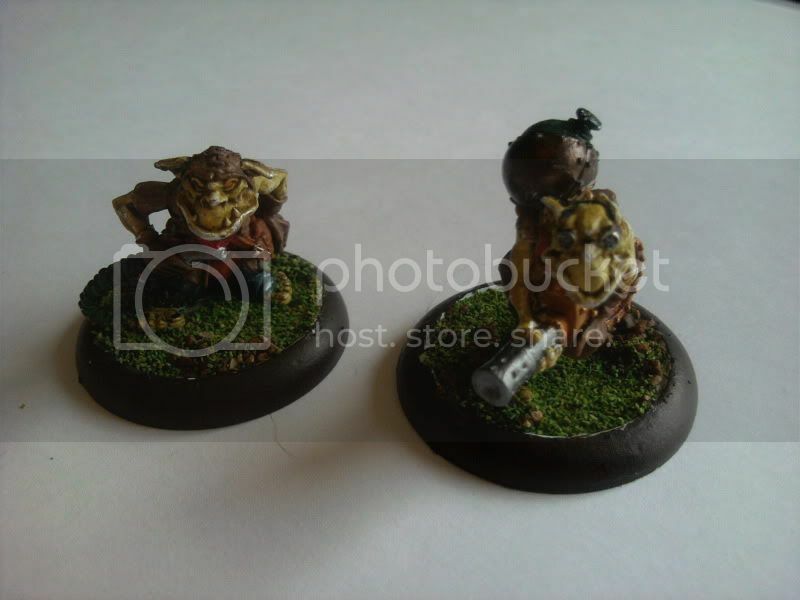 Here is a pic of the ones I brought to the table, my Swamp Gobbers who have yet to earn a name. I started them and went with a really ugly puke yellow color that was a mix of bloodstone and moldy ochre for the skin. All I had time for was the skin before I passed them and didn't see them again for the rest of the night. All that is left for me to do is mark the bases and drybrush a few spots and they're done. All in all a fun way to paint models and like I said almost every fig turned out great, just don't ask Adam about Strakhov. Without further delay I give you the results of our 'Show Me Your Caber' contest. 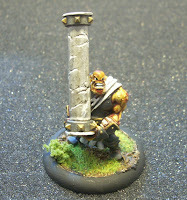 Russ will be the proud owner of another Caber and also be subject to future scrutiny from The Scrum. Matt & Joedj will also receive Cabers just for participating. Thank you all for your paticipation and we look forward to a new addition to The Scrum in the form of a painting and modeling section. Here are some of the other submissions.